Subject:An Ice Age river flowed across the high desert in the rocky canyon near the marker. Ages ago a river flowed across the high desert country in the rocky canyon several hundred yards beyond the marker. The prehistoric river drained a large ice age lake that formed from the blocking of normal drainage in the area by lava flows. The lake covered a large area to the east in the vicinity of the present millican country. During periods of high water the lake spilled over a low pass at the eastern edge of horse ridge-the ridge seen behind you and to your right. 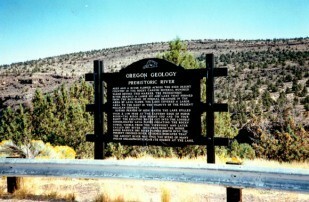 The escaping water cut into the loosely consolidated lava flows creating the rocky gorge visible from the viewpoint and later called Dry River. 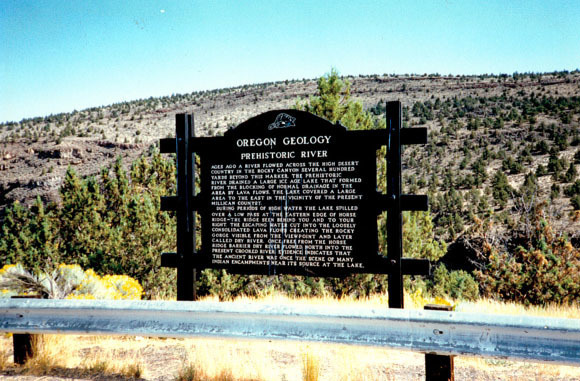 Once free from the horse ridge barrier dry river flowed north into the present Crooked River. Evidence indicates that the ancient river was once the scene of many Indian encampments near its source at the lake.